Put a colander over a large bowl and empty the contents of the pot into the colander, reserving the bean cooking liquid. Add the juice of 2 lemons, 2 cloves of garlic, 2 to 3 tablespoons of tahini (unless you find it to be bitter-tasting, then add less) to the bowl of the processor. Whir until they’ve blended thoroughly and you have a very loose paste. Add the chickpeas to a food processor and a little of the bean-cooking liquid. Process to smoothness. Add a generous pinch of salt and a pinch of cumin. Taste for lemon and garlic and tahini. Add more as your taste directs you. I like to add a glug of olive oil to the puree itself, but it’s optional. Add enough of the bean cooking liquid so that what results is a silky smooth puree. Soak and boil an extra ¼ cup of chickpeas and keep them aside (about ¾ cup cooked) to reheat just before serving. Spread the hummus in a clay dish, and pour the drained hot chickpeas on top; drizzle liberally with olive oil and sprinkle paprika and chopped parsley. Garnish with a just a few cooked chickpeas and olive oil. Sprinkle sumac and a little chopped parsley. Serve with warmed flat bread brushed with olive oil and sprinkled with za-atar and salt. Scoop it up with fresh pita. To print a shortened version of the hummus recipe, click here. 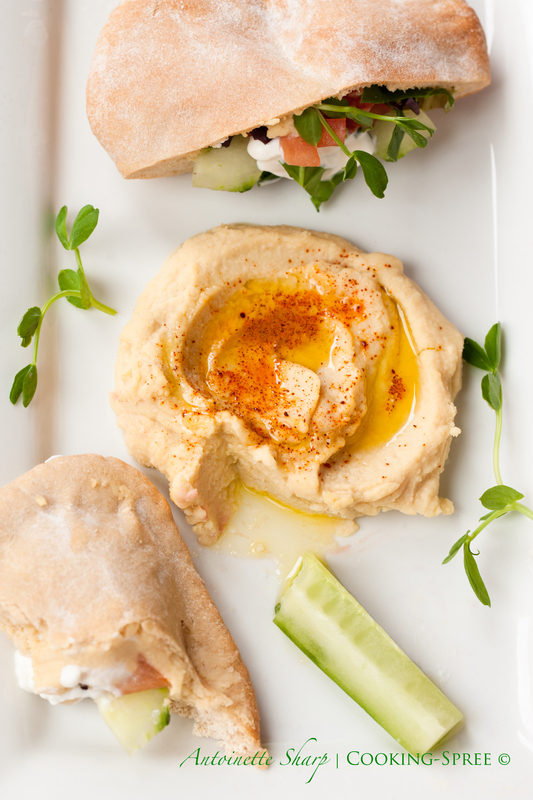 Nothing better than hummus, especially with fruits and veggies and pita – Yum:) Happy Tuesday! Nothing like it in the world…and thanks for the reminder about fruit and hummus! I love sweet-tart apple wedges dipped in hummus too! Have a wonderful day! Positively beautiful and sounds so smooth and velvety. Would eat a whole batch right now with that heavenly bread of yesterday. And I love that idea of helping those little chickpeas along in the process — helping them to peel their skins…you come along at the right time, right place. Haha! You are so fun. I said I was anxious to see what you were going to use to fill your pita pockets and you certainly didn’t disappoint, Spree. Your hummus sounds delicious and has tempted me to try making it — something I’ve never done before. I can only imagine how good it tastes in your freshly make pita. It’s pretty wonderful John, that combination of fresh from the oven pita slathered in lemony hummus, drizzled with extra olive oil – if you like that sort of thing, that is. 🙂 Maybe you’ve found a good source for good hummus…you’ve found a good source for about everything else wonderful under the sun! But if you haven’t, I hope someday you’ll try! Thank you SO much Claire! I’ll check it out! Excited to! You’re a dear, thank you, Claire! It’s now on my regular reading (eating) list! Oh, Tanya, how lucky you are, a neighbor’s own chickpeas! I can see why you’d reserve an extra suitcase for them! And thank you for your nice comment! And YES, Ottolenghi’s brilliant! Om nom nom, just my thing. Beautiful pockets and delicious hummus. Cracking stuff going on here 😀 Frugal too! I would think squeezing each and every chickpea would be a rather lonely job. I think the bicarbonate of soda is the better route. Very clever title. Well, you’re right Maria, it CAN be a lonely job…or it could be shared…have little ones at home and it’s JUST the sort of things they’d LOVE doing! However, that being said, if you’re cooking your own beans, the bicarb of soda is a much easier route and yields the same creamy results! Thanks very much for your comment! 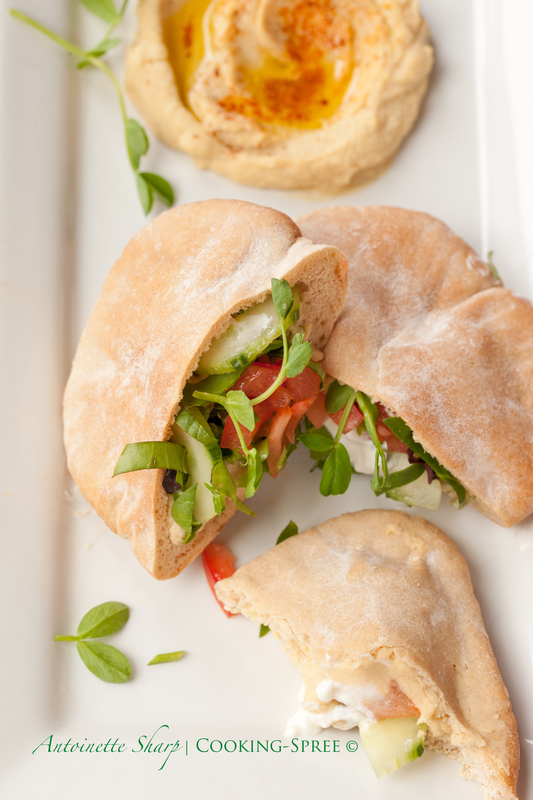 Hummus is always in our kitchen, as is pitta bread. A plate with both of them is often by me as I write – like now! The baking soda tip has been taken on board. Seems like perfect brain food when writing! Glad you thought of it and that I can borrow from it! I’ve always wanted to make hummus, but its one of those things that I’ve just never gotten around to making. But you’ve really inspired me to give it a shot, especially since yours looks like the perfect recipe. I’m so happy to see that you added lemon. Whenever I buy the store bought stuff I always squeeze a bit of lemon juice on top to brighten it up a bit. So, when I see that you’ve already added it to your recipe I knew that this was one for me. Also, I have to add that I love your garnish ideas and the photos that you took. They are really beautiful. That is the best homemade hummus recipe I have seen yet! Good job! This hummus will be good, even without the tahini. I’ll be honest though – it’s even more delicious with – and the combination of sesame seeds (from which tahini is made) and the chickpeas forms a complete protein so you’re getting a nutritional boost. Still, don’t hesitate to make it without…you won’t be sorry. 🙂 And thanks for your comment too! Thanks so much!! I’ll definitely look next time I hit the grocery. What area should I look in for it? (Or sesame seeds, for that matter. Lol) Thanks, again, for your reply!